Yolanda de Castro, president and GM of Universal Staffing Services Inc.,receives the FIEA trophy on behalf of the Abu Dhabi National Oil Co. from Sto. Tomas and Imson. Se Kun Shin, director of Enoch Semiconductor, poses with Sto. 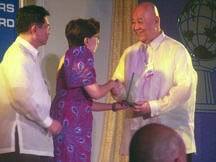 Tomas and Osmeña after receiving the FIEA trophy. 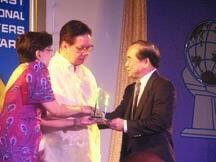 Sadao Ouchi, executive vice president of JGC Corp., receives the FIEA trophy from Sto. 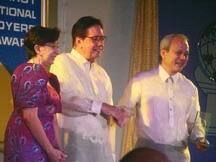 Tomas as Imson looks on. 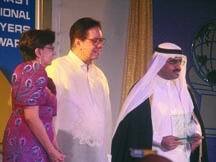 Fahad Al-Msaibeeh, Employment Attache of the Royal Embassy of Saudi Arabia, shakes hands with Osmeña after receiving the FIEA trophy for the Ministry of Health of Saudi Arabia. 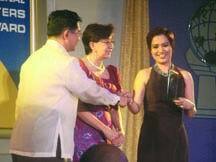 Loreto B. Soriano, Senior Quality Management Consultant of Mega Manpower Corp. (right), shows the FIEA trophy he received on behalf of Northwest Armed Forces Hospital. 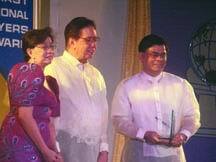 Cesar Averia, president of EDI Staffbuilders International Inc.,shakes hands with Osmeña after receiving the FIEA trophy on behalf of Saline Water Conversion Corp.
Angelito C. Hernandez, president and managing director of the Ind’l Personnel and Mgmt. 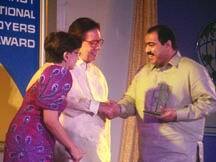 Services Inc., shakes hands with Osmeña after receiving the award of Saudi Basic Industries Corp.
Abdulrahman Al-Faiz, director of the Social Insurance Hospital of Saudi Arabia, poses with Osmeña and Sto. Tomas after receiving the FIEA trophy. Rabea Al Junaibi, vice president of Abu Dhabi Ship Building Co., receives the FIEA trophy from Sto. 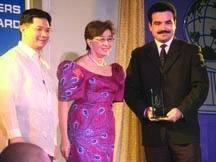 Tomas as Imson looks on. Abel Nolasco, executive assistant manager of Hyatt Manila, proudly shows the FIEA trophy he received for Hyatt International Hotels & Resorts. With him are Sto. Tomas and Imson. 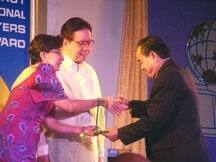 POEA chief Rosalinda Baldoz shakes hands with Osmeña after receiving the FIEA trophy on behalf of King Saud University as Sto. Tomas looks on. 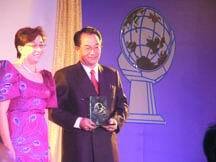 Chung-Hsing Chou, Consul of the Taipei Economic and Cultural Office, shows the FIEA trophy he received on behalf of Nan Ya Plastics Corp.. With him is Sto. Tomas. Janet Rees of Northwest London Hospital NHS Trust shakes hands with Imson after receiving the FIEA trophy from Sto. Tomas. 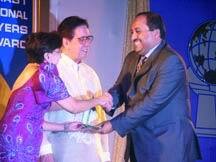 Faisal Saddik, manager of Saudia Phils., shakes hands with Sto. 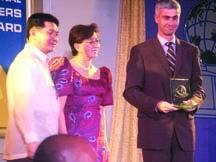 Tomas as he receives the FIEA trophy on behalf of the Saudi Arabian Airlines while Osmeña looks on. 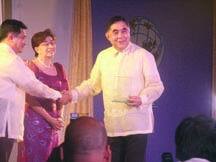 Raymond Hernandez, VP for int’l operations of IPAMS, shakes hands with Sto. 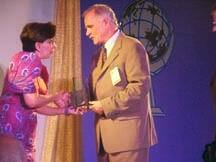 Tomas as he receives the FIEA trophy on behalf of the Saudi Cable Company. Ralph Hayashi, general manager of Thomas J. Davis Inc., shakes hands with Sto. 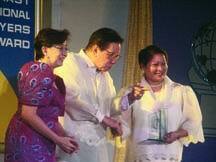 Tomas as he receives the FIEA trophy while Osmeña looks on. 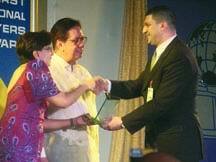 Elie Goshn, human resources director of Al Maousherji Catering Co., receives the FIEA trophy from Sto. 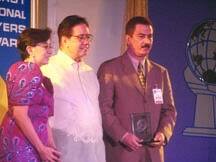 Tomas as Sen. John Osmeña looks on. Herman Van Driessche, Crew Manager of Jan De Nul N.V., shows the FIEA trophy he received for his company as Sto. Tomas and Imson look on. 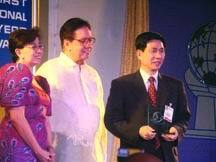 Siu Lin Tan, chief executive officer of L&T Group of Companies Ltd./Tan Holdings Corp., shakes hands with Sto. Tomas as he receives the FIEA trophy while Imson looks on. 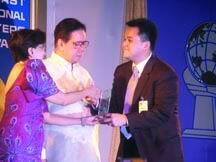 Rodolfo S. de Lara, president of the Philippine Hospitals and Health Services Inc., receives the FIEA trophy on behalf of the National Guard Health Affairs-King Abdulaziz Medical Cities. 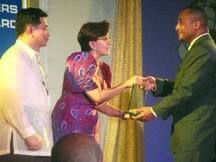 Leonardo B. de Ocampo, chairman of Omanfil Int’l Manpower Dev’t Corp., shakes hands with Imson after receiving the FIEA trophy of Petroleum Development Oman. Munir Rafie, executive director for employee relations & training of the Saudi Arabian Oil Co., poses with Sto. 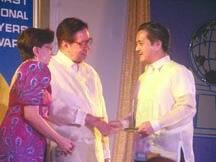 Tomas and Osmeña after receiving the FIEA trophy. Eric Parsons, CEO of the Shaik Khalifa Med’l Center/Interhealth Management Canada Ltd., shakes hands with Sto. Tomas as he receives the FIEA trophy. Kathy Perryman, Senior Nurse Facilitator of University College London Hospitals NHS Trust poses with Sto. 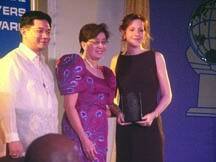 Tomas and Imson after receiving the FIEA trophy.